This is a description of herd dynamics written by one of our previous working students, Naomi Sharpe, from her own observations of horse behaviour in a semi-wild herd in the US. Within a herd there is typically a lead stallion and a lead mare. It is their role to keep the herd safe and moving. 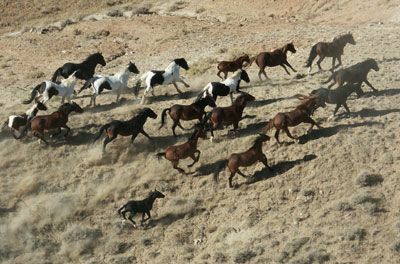 With the lead mare at the front of the herd, and the stallion pushing from behind, they lead the community to food and water. 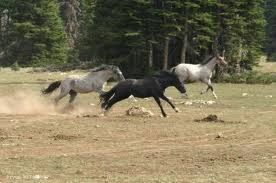 In wild horse herd dynamics, the stallion also has a second role of resolving any conflicts between other horses. From an observational point of view, it is very interesting to note that in certain situations the stallion chooses to intervene, but in others he does not. For minor disputes, if he considers that it is in the best interests of the horses concerned to fight it out alone in order to learn a particular lesson, he will let a conflict go ahead, all the while keeping a watchful eye on the proceedings. If, however, the fight is more serious, puts the herd in danger, or threatens his position as lead stallion, he will intervene by displaying aggressive body language. In most cases, this means lowering his neck and flattening his ears towards the other horse, often with a short charge. If this is not enough, he will display all of this behavior with a bite or kick at the end. 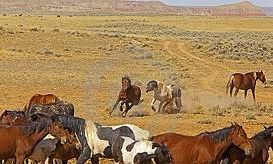 As soon as the message has been received the stallion becomes very passive and resumes whatever activity he was doing before the conflict, such as eating or grooming. The rest of the herd has a pecking order from the highest-ranked horse, after the lead mare and stallion, to the lowest-ranked horse. When a horse is introduced into the herd, they initially begin at the bottom of the ranks. It is up to them to work their way up (or not!) by challenging and gaining the respect of the horse above them. They do this by claiming the higher-ranked horse’s space. A good opportunity for a social climber presents itself when the higher-ranked horse is not paying attention. If the lower-ranked horse chooses to take this opportunity, he sneaks up on the other horse, trying to physically make them move away from that particular space of land. If successful, the lower-ranked horse claims that space and therefore a higher position in the herd. Although this is one of the most common methods in herd dynamics, it is not the only way in which rankings can change. Another example is when a colt reaches maturity and is expelled from the herd, his position becomes “vacant” ready to be filled by another horse. It is interesting to note that although the dynamics and pecking order are constantly changing, it is rare for individual horses to make big leaps in the ranking. A higher-ranked horse will typically have a more dominant personality and will stay near the top, whilst a lower-ranked horse will generally be more passive and accept a lower place. New members gradually climb from the bottom to the rank that fits their personality and from there regularly climb or fall one or two “notches”, hovering around the same general level. Horses have a daily routine and pattern which they follow. This can vary according to their living environment and the time of year, but commonly they start the day by eating and then carry out mutual grooming. This is the easiest time to observe bonds between members of the group – many horses seem to have a “best friend” who is their favourite grooming companion, and with whom they spend a lot of time. As well as grooming, the horses may take the opportunity to rest, either by lying down and soaking up the sun, or by staying on all-fours, half asleep. Others stay awake to watch out for predators. From there they move on to the water hole, where they get a drink or take a bath, rolling in mud afterwards as a way to protect themselves from the sun. From there they often go back to grazing and the cycle recommences. The annual birth of foals is an important part of herd life. 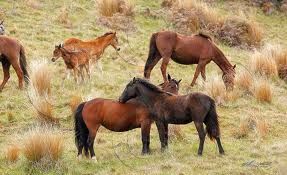 A pregnant mare will usually move away from the herd to have her foal with the stallion in position on the edge of the herd, giving her some space yet remaining close enough to protect her if necessary. The herd dynamics are set up to ensure the safety of the foal - the herd's future. Within hours of the birth, the foal is up on his feet suckling from his mother. There is an incredibly strong bond between the mare and the foal; the foal doesn’t leave his mother’s side until confident enough to explore the environment. 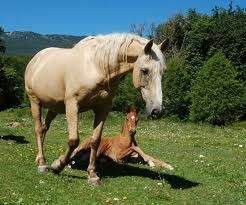 The mare makes sure that her foal keeps moving so that he develops good muscle strength and keeps safe from predators. The stallion also takes a proactive role in the foal’s up-bringing by playing and teaching the foal about herd etiquette. Observing horses demonstrating natural behaviours and herd dynamics in their natural environment helps us as humans understand our role when interacting with domesticated horses. If we bear herd dynamics in mind, we can communicate in a language that all horses can understand with ease. This allows a real conversation to be had between horse and human, that is not only very effective in training horses, but is also hugely fulfilling. 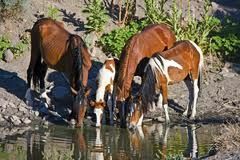 Find out how you can make your horse's environment more similar to that of a wild horse herd with a Paddock Paradise.